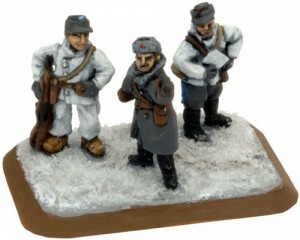 Battlefront is featuring their Jaakari Rifle Platoon in winter gear for Flames of War over on their website. Each Finnish division has a light detachment which includes a Jääkari (Jäger or Light Infantry) Battalion of three companies. These companies are more lightly equipped than normal infantry companies and have three platoons per company instead of the usual four platoons. They also have more transport and are more nimble than infantry companies. Their tactics emphasise speed and mobility, utilising skis during the Winter War to swiftly move through the forests. These highly motivated and skilled fighters are men from rural areas and have excellent fieldcraft skills.